Hey there. I am back into fitness mode! I had a long time away from fitness due to all my time being spent on home renovations and work. But I was finally able to carve some time out of my schedule to take care of me. I've started to run early mornings and I've started to finish off my day with a little jump rope session. I think jumping rope is an awesome cardio exercise. It pumps you up, it works out your calves and abs, and if Rocky does it, why not I? lol Anyways, I've gone through quite a bit of ropes in my lifetime. They either ripped, broke, or were not the right length for me. I always thought that that was just how it was with jump ropes. You changed them up every year or so. Especially if you get good use out of it. Well, my friends, I've been throwing money away on jump ropes all these years. Our good friends at Naturalico created one hell of a jump rope that will stand the test of time. It has a high speed cable with 4 high grade metal bearing to help increase speed and RMPs. It's perfect for cross fit training! And guess what, they provided me with a Naturalico Fast Speed Cable Jump Rope to review! So why is this jump rope top tier? Let me give you my thoughts. This is one great top tier quality jump rope! First off, the cable is wire cable encased in a strong, flexible nylon plastic. Tough enough to deal with high intensity training. So this isn't a standard jump rope that will wear and tear on you. Also, the rope handles turn at a 90 degree angle. This allows for better posture while jumping rope AND will prevent the rope from tangling when putting it away. Then there are the metal ball bearings that the rope handles are attached too. These metal bearings are nowhere near cheap. They are top notch and will allow you speed up your turns to allow faster double and triple unders! Another great feature of this jump rope is the length and ability to adjust the length using the adjustment screws that are placed on the rope. The jump rope is 10 feet long, enough to accommodate the biggest of people, but most of us are going to need a shorter rope. Once you adjust the rope to the desired length, you can tighten the adjustment screws and secure the rope handles to that spot. You can then choose to cut the excess rope so that you don't have that extra piece hanging off the end of the rope. I absolutely LOVE that. Adjust the rope to the desired length and tighten these screws. 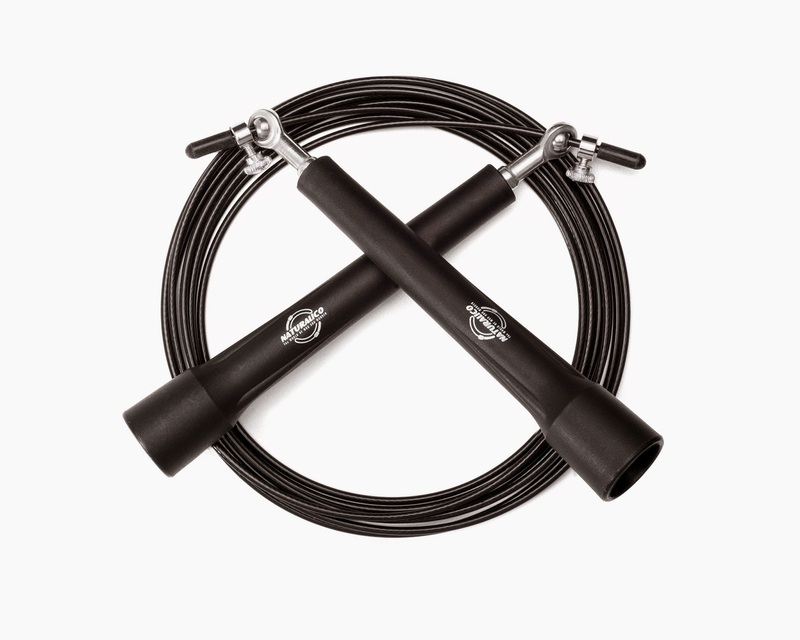 It's the perfect way to customize your Naturalico jump rope to your liking. This Naturalico Fast Cable Jump Rope addresses all of my previous problems and takes care of them easily. And the best part is that the rope is pretty light weight so I can carry it around with me wherever I go. And speaking of carrying it around, you get this pretty nifty storage bag with your jump rope. It makes it easier to just stash your rope in the little bag and take off. So how did it do while actually jumping rope? Pretty awesome! I didn't go too fast since I'm just getting back into the habit but I did use the jump rope in my garage for the better part of two weeks. The floor in the garage is concrete so I figured that there will be a bit of tearing on the nylon casing since it will be slamming into the floor. I was wrong. The nylon plastic held up pretty good. No tears in it and there doesn't seem to be any signs of it giving way. It may still be too early to tell if it'll stand the test of time, but so far so good. Also, the metal ball bearings definitely make a difference. Turning the rope was so smooth. I felt like I had to put little effort to really make the rope swing. I attempted a double under and I almost made it. I've never even come close before so I was pretty happy knowing that once I'm back in full force, I'll actually be able to do double unders and increase the intensity of my jump rope session. lol Oh, that reminds me. Because of how quickly the jump rope moves, if the sucker hits your shin, it's going to hurt. IT'S REALLY GOING TO HURT!!! lol Trust me, I know. But that's not exclusive to just this jump rope. All ropes are going to hurt when they hit you, I'm just warning you that this one may sting just a tad bit more, so be careful! So far, this is the jump rope to end all jump ropes. It's quick, it's fast, it's lightweight, and it's durable. What else do you need? A jump rope like this would easily sell for about $30 bucks but you can pick one up at Amazon for under $16. It's well worth the money, especially if you're serious about your cardio workout.